Here’s why you should use RC Essential Oil. RC is a blend of myrtle, marjoram, pine, lavender, cypress, black spruce, peppermint, and three different types of eucalyptus essential oils. RC is a blend of myrtle, marjoram, pine, lavender, cypress, black spruce, peppermint, and three different types of eucalyptus essential oils (globulus, radiata, and citriodora). RC Essential Oil one of the most popular essential oils that Young Living has for healthy breathing. Considering a blend that has this many different powerful essential oils, the aroma itself leaves you feeling invigorated and highly supported. Apply drops of it directly over your chest and throat, or diffuse about 4-5 drops of it in your diffuser. Add 2-3 drops onto a hot towel and apply it on your neck and chest area as often as you need it. Add drops of RC to a bowl of steaming water, put a towel over your head, and inhale the steam directly above the bowl. If congested, apply one drop under the nose and on the bridge of the nose, and if it’s really bad put a drop on a Q-tip and swipe nostrils. Take a couple of drops of RC in your palm, rub your hands together, then cup them over your nose and breathe in deep. It really opens up your airways and to breathe easier. A lot of people love this oil since it can open up their lungs and airways and allow them to breathe better and deeper. Athletes have reported being able to run longer distances with faster times because of this oil. Rub one drop on your chest and over your throat before your workout. Make Infused Tissues: Remove tissues from their box. Pour 3-4 drops of RC onto a cotton ball and seal the cotton ball with the tissues in an airtight container for 24 hours. Remove tissues and replace in the box. Repeat as needed to refresh the scent. 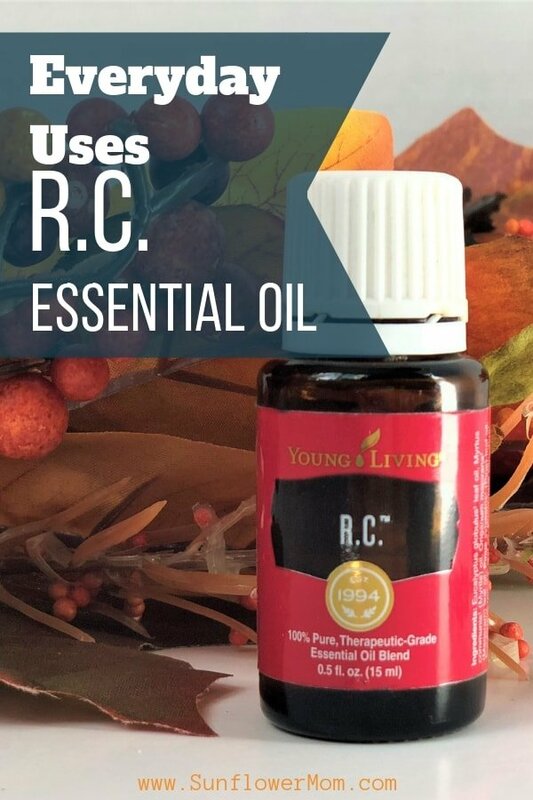 RC essential oil is Young Living’s special blend. You can become a member of Young Living and get all their benefits and a full kit or just a bottle of RC when you sign up as a retail customer. More information on what is included in the full membership HERE. Direct link to sign up as a Retail customer and just buy a bottle of RC Essential Oil HERE.